For Immediate Release – The thundering sound of dozens of vintage American V-Twin engines roaring wide open across steep oval tracks is a ruckus that hasn’t been heard in nearly 75 years. However, that will all change at this year’s Daytona Bike Week when the Sons of Speed vintage motorcycle race will hold its inaugural event with Blue C United’s Matt Harris competing as one of the daring pilots atop his vintage Harley-Davidson machine. Modeled after the “board track” style of racing that swept across the country in the early part of the 20th Century, the race harkens back to an era of dare devil racers providing thrilling and often dangerous racing to packed houses. This style of racing quickly faded with the onset of the Great Depression of the 1930s, but led by promoter and renowned bike builder Billy Lane, the Sons of Speed race will bring that excitement and nostalgia back at the New Smyrna Raceway to thousands of rowdy Bike Week enthusiasts. The rules and bikes themselves are very simple: Pre-1925 1000cc American V-Twin engines, no brakes, no transmission, no clutch. That’s it. 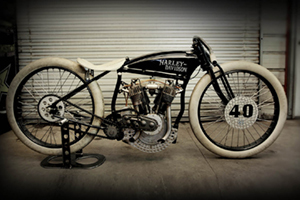 Blue C United’s Harris was excited to be included in such a momentous event, and he spent nearly two months building his 1923 Harley-Davidson powered race machine at his Tennessee based 40 Cal Customs shop. Modeled after the simplistic designs of the race bikes of the era, the machine features a tight and compact frame that Matt expects to propel him at speeds of up to 80 mph – with no brakes! Also slated to race include the who’s who in the two wheeled world – including Rick Petko from Discovery Channel’s American Chopper, Jay Allen from Broken Spoke Saloon fame, Buzz Kanter Publisher of American Iron Magazine, and of course Billy Lane. Matt and Blue C are extremely excited to be a part of this legendary event as it pays homage to an important time in American motorcycling history. About Blue C United – As the brainchild of Jeff Bentley, Executive Creative Director of Blue C Advertising, the Blue C United initiative was formulated to help recognize and support true American craftsman from numerous creative arenas. Blue C strives to be an intersection where culturally relevant marketing and creative campaigns help inspire those that are in alignment with these creative passions. The Blue C United initiative is aimed to successfully highlight the efforts of these artisans across multiple channels.